The fashion and stage designer known as Erté was born in 1892 to a wealthy family in St. Petersburg , Russia by the birth name Romain de Tirtoff, and he may be the epitome of flamboyance not to mention longevity in the 20th century design. From an early age, Erté did not wish to follow his father, who was an Admiral in the Imperial Russian Navy, into the military. Erté showed extraordinary talent for design, creating his first costume at the age of 5 and subsequently moving to Paris in 1912 at the age of 18. There, he found work immediately as a fashion illustrator and learned the art of couture working with Parisian designer Paul Poiret, visualizing how clothes could affect the look of the female body. He was hired by the magazine Harper's Bazaar where his flamboyant fashion designs of elaborately plumed hats and long, flowing dresses perfectly captured the emerging design aesthetic of the Art Deco period. He continued working at Harper's Bazaar for 22 years, creating over 200 magazine covers for the publication in his distinctive style. 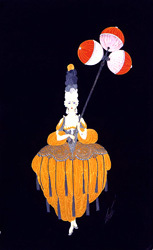 While there, he was also approached to design stage sets and costumes for the girls of the famous Folies-Bergère and at the George White's Scandals Club in New York City. He also worked in the 1920s and 1930s on film costume design at the MGM Studios in Hollywood as well as opera and theatrical productions, any venue where he could indulge his eye and appreciation for exotic human forms that were scandalously costumed and exuding the sexual power of the female body. 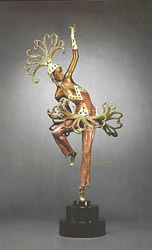 Americans were exposed to his work through some extravagant designs he did for productions at Radio City Music Hall in New York. He lavishly clothed many of the most famous women of the day in theater, film, and politics including Lillian Gish, Marion Davies, Mata Hari, Joan Crawford, Norma Shearer, and Anna Pavlova. The flamboyance of Erté's designs declined in popularity with the advent of World War II, and after the war citizens had more basic needs that first needed to be fulfilled. However, Erté underwent a rebirth of sorts in the 1960s following a Paris exhibition of his work, and he created important series of limited edition lithographs and sculpture which evidenced the styles for which he had become so well known in the 20s and 30s. Early Erté print work in the 1970s was produced by the Circle Fine Art Corporation and later by Chalk & Vermilion. Erté was productive well into his 90s, even producing new designs and graphics just before he died in 1990 at the age of 98. His designs are in many of the major museums of the world including the Metropolitan Museum of Art, Museum of Modern Art, Smithsonian Institution, and the Victoria & Albert Museum. Buy Erte and other Art Deco decorative arts on the Collectics Art Nouveau & Art Deco and Fine Antiques pages, or search the entire site for great antiques, collectibles, and crafts for every collector!